You are welcome to download the graphics and use them for free in your personal website, emails, blogs,social networking site etc. You are not allowed to redistribute or use for commercial purposes. Do not link directly to these images. Save them on you computer. Please read term of use before downloading. if you use my graphics please link back. It's party time. 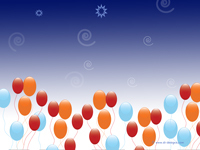 Download Fun Party desktop wallpaper or use as a background to your web page or email.